Nationally, 93% of young people in England are educated in state-funded schools and colleges, but only 61% of Cambridge university undergraduates are drawn from the state sector, a figure which has recently fallen. At Oxford university the proportion is less than 57%. It seems the various efforts to shift this under-representation are having little effect. The challenge is particularly great for students who were eligible for Free School Meals (FSM). As Tim Dracup has pointed out here, the latest destination data for England (2013) highlights a ‘continuing failure to increase the proportion of Free School Meal (FSM) students entering Oxford and Cambridge.’ This figure has been stuck at a total of 50 for 3 years in succession while the figure for the Russell group as a whole has grown strongly (up 46% in those 3 years). As Tim says: ‘this desperately low figure is hardly a ringing endorsement of our collective efforts to improve fair access to Oxbridge’. Despite a very strong increase in the number of students progressing to the most selective Russell Group universities from our sixth form college (from 42 in 2012 to 93 in 2015), we have still not ‘cracked’ Oxbridge either. Despite all our work with high achieving students and excellent academic enhancement projects with Oxbridge colleges, our numbers actually progressing to either Oxford or Cambridge universities fluctuates within the range 0-3 per year. Based on the most recent national destinations data, publicly funded sixth forms nationally and in London would expect around 8-9% of their ‘Russell group A-level cohort’ to progress to Oxbridge on average. So at NewVIc we should realistically be aiming for 5-6 students per year to progress to Oxbridge; something which should be possible based on what we know about our highest performing A-level students. Such a single-figure increase may be small, but it is a worthwhile aim if we want more working class, black and minority students to access what Oxbridge has to offer. Multiplied across the many other sixth forms facing the same challenge, this scale of increase would make a significant difference. Whatever we think of the assumption of a steep hierarchy of universities in England, we have a responsibility to work towards better representation of our students at the pinnacle of that hierarchy. Speaking at a conference on this subject in 2014, I described the challenges we face as being about geography, applications, culture and partnership and I made some suggestions for further action: engaging more strategically with London and other major cities through local sixth form hubs, improving the interview process and setting local targets for applications and offers. But actually I think that something more radical has to be done if students from Newham and other ‘disadvantaged’ areas are to have a fairer share of Oxbridge opportunities and if we are to help change the class and ethnic profile of these two universities and start to make them more representative of the national cohort of academically successful students. 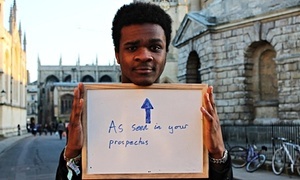 At least one college in each of Oxford and Cambridge universities could set itself a target of recruiting 93% of its undergraduates from state-funded sixth forms. They might also consider proportional geographical targets, targets for black and minority ethnic students and for students eligible for free-school meals. This would involve just one college in each university taking a policy decision to try to fairly represent the national profile of students with respect to the institutions they studied at, together with some other characteristics. By doing so, they would be recognising that there are many very qualified young people who are not progressing to Oxbridge and demonstrating that they are serious about recruiting them. It would also show their commitment to a more representative student body. The proposal will no doubt be criticised for discriminating against students from private fee-paying schools, white students, better-off students etc. Such a plan would indeed require a college ‘quota’ for certain categories, but in the face of such stubborn under-representation it is the equivalent of a political party using women-only shortlists in some constituencies for a few years to kick-start a much-needed shift towards gender parity. It would not prevent private school applicants from getting places and it would demonstrate to the other colleges that greater equity does not require any drop in standards. The creation of at least one college in each university with a large majority of state-educated students could promote a new culture of inclusiveness which might start to catch on across the rest of the university. Strong candidates from publicly funded sixth forms would be more likely to apply to places which clearly welcomed and valued them and the overall proportion of students from ‘non-traditional’ backgrounds would start to increase. Gradually, the barriers which some potential applicants experience would be overcome and the sense that ‘this is not a place for people like me’ would be replaced by the reality that ‘there are plenty of people like me here’. This is not a new suggestion, something similar was proposed a year ago by Lorna Finlayson, a research fellow at King’s College, Cambridge in a Guardian opinion piece here. Something more clearly needs to be done if we really want to shift the profile of Oxbridge undergraduates towards that of the population as a whole. So let’s start by asking all the colleges in both universities which of them will be the first to aim for a ‘representative’ intake and see if any of them have the vision to take this historic first step. Photo from the ‘I too am Oxford‘ campaign. This entry was posted in Education policy, NewVIc and tagged Cambridge university, Education, free school meals, Lorna Finlayson, Newham Sixth Form College, NewVIc, Oxford university, Russell group, Social mobility, university progression. Bookmark the permalink.